Using information from physics, biomechanics and evolutionary biology, we explore the implications of physical constraints on sperm performance, and review empirical evidence for links between sperm length and sperm competition (where two or more males compete to fertilise a female's eggs). A common theme in the literature on sperm competition is that selection for increased sperm performance in polyandrous species will favour the evolution of longer, and therefore faster swimming, sperm. This argument is based on the common assumption that sperm swimming velocity is directly related to sperm length, due to the increased thrust produced by longer flagella. We critically evaluate the evidence for links between sperm morphology and swimming speed, and draw on cross-disciplinary studies to show that the assumption that velocity is directly related to sperm length will rarely be satisfied in the microscopic world in which sperm operate. We show that increased sperm length is unlikely to be driven by selection for increased swimming speed, and that the relative lengths of a sperm's constituent parts, rather than their absolute lengths, are likely to be the target of selection. All else being equal, we suggest that a simple measure of the ratio of head to tail length should be used to assess the possible link between morphology and speed. However, this is most likely to be the case for external fertilizers in which females have relatively limited opportunity to influence a sperm's motility. Although several theories regarding the evolution of sperm size exist [for reviews see [1, 2]], there is a general assumption in the literature on sperm competition that selection will favour males with longer sperm, due to their enhanced swimming velocity and therefore competitiveness. This assumption rests broadly on three observations. First, a number of comparative studies have reported that sperm are on average longer in polyandrous species compared to monandrous species [e.g. [3–5]]. These evolutionary associations are generally taken as evidence that selection for enhanced sperm competitive ability favours increased sperm length in polyandrous species, where females mate with more than one male during a single reproductive episode and sperm from different males must compete to fertilize available ova . Second, a handful of studies have reported that relative sperm size can be associated with competitive fertilization success [e.g. ]. And third, four studies have reported that sperm swimming velocity, and therefore possibly sperm competitiveness, covaries with some measure of sperm length, hinting at a functional relationship between these phenotypic traits [4, 8–10]. While the first two of these observations are correlational, the last suggests a mechanistic relationship linking sperm structure to function. However, empirical evidence of such a link is conflicting (Table 1). Explaining why longer sperm might be more competitive than shorter ones, and how selection acts on this difference, is fundamental to our understanding of sperm evolution. Thus, our aim here is to re-evaluate the proposed link between sperm length and swimming speed using theory from physics and biomechanics. We explore the hydrodynamic environment in which sperm operate, which we argue invalidates common assumptions that link sperm shape and length to swimming velocity. We then argue that because of the underlying hydrodynamic interactions governing sperm motion, there is no reason to expect a simple association between sperm length and sperm velocity. Instead, we propose alternative measures that take account of these interactions in an attempt to guide future studies that link sperm competition with sperm evolution. We argue that the focus on sperm speed and length has come at the expense of neglecting alternative mechanisms that can help explain a wider variety of the data available. Published relationships between sperm phenotypic traits and swimming speed. Key: +, positive correlation between length and speed; -, negative correlation between length and speed; and 0, correlation analysis performed, but no relationship between length and speed found. We argue that the complex physical constraints governing sperm locomotion may obscure simple relationships between sperm length and swimming velocity, thus accounting for the inconsistent patterns of covariance between these traits reported in the literature. To illustrate this, we first explore the hydrodynamic environment in which sperm operate, which we argue invalidates common assumptions that link sperm shape and length to swimming velocity. The diversity of sperm size and shape is considerable [e.g. ], but in general the body plan of a flagellate spermatozoon follows the pattern of a head containing the nuclear material, a midpiece containing mitochondria, and a tail based on the eukaryotic flagellum. Superficially, the shape of the tail and the motion of swimming are eel-like, and it is often assumed that locomotion too works in a similar way. However, small size and low swimming speeds mean that, in hydrodynamic terms, sperm operate in a very different regime from the one that we are used to. This regime can be defined by the use of the Reynolds number, which is equal to the relative ratio between inertia and viscosity. The Reynolds number is given by Re = ul/μ, where u is speed, l is a characteristic length of the object of interest (conventionally length in the direction of travel, e.g. total sperm length), and μ is the kinematic viscosity of the fluid relative to which the object is moving. In the context of biology, size and speed tend to be positively correlated , so that in their natural environments small organisms operate in a low Reynolds number regime (Re << 1). Streamlining, the modification of shape to reduce drag, is commonly seen in human vehicles, as well as in birds, fish, insects and aquatic mammals. Streamlining acts to reduce the costs of transport by reducing the amount of resistance that the body experiences while moving through a fluid, by delaying separation of the flow from the surface of the object. The idea that the more streamlined the sperm head appears to be, the faster it will be able to swim is attractive, but misguided (Table 2, Figure 2). This is because sperm operate in a low Reynolds number world  where our intuition is often wrong. In fact, the very concept of streamlining at low Reynolds numbers is invalid, as streamline separation only occurs when inertia becomes the dominant force at work. Our everyday experiences of movement and of the behaviour of fluids are not necessarily applicable in situations where viscosity, not inertia, dominates. We are used to the effects of inertia, where stopping and starting require some time to occur, and where a swimming animal imparts rearward momentum to the surrounding fluid in order to move forwards. In contrast, small, slow organisms exist in a world where inertia can effectively be ignored, and viscosity dominates. This has many implications [12, 68, 69], but the most relevant here is that drag becomes much more important than inertia, such that when propulsion ceases, so does movement. Under such conditions, the component of drag due to the friction between the fluid and the object's surface greatly exceeds that due to pressure differences between the front and back of the object. In this case, the extra surface area realised by changing from a sphere to what we consider a 'streamlined shape', such as that of a fish, can outweigh the reduction in pressure drag. To illustrate, figure 2 shows the relative difference in drag between a sphere and a 'streamlined' body (in this case a prolate spheroid), similar to many spermatozoan heads, at low Reynolds number. Drag with respect to volume (drag per unit volume) is likely to be most important in this context, as volume most probably determines the payload (DNA) or energy stores (mitochondria or their analogues) available to the spermatozoan, so we compare spheroids of equal volume. The conclusion is that drag on a prolate spheroid differs by maximum of 4.44% (for a 2:1 length:diameter ratio) from that of a sphere, and that for ratios higher than 4:1, drag on the 'streamlined' shape is higher than that for a sphere of equivalent volume. We suggest that it may be possible to use this relationship as a null model against which to test whether head morphology is under selection for hydrodynamic or non-hydrodynamic aspects of fertilisation success. Percentage difference in drag between a sphere and a prolate spheroid of identical volume at Re << 1. As the ratio of length to diameter of the spheroid increases (i.e. 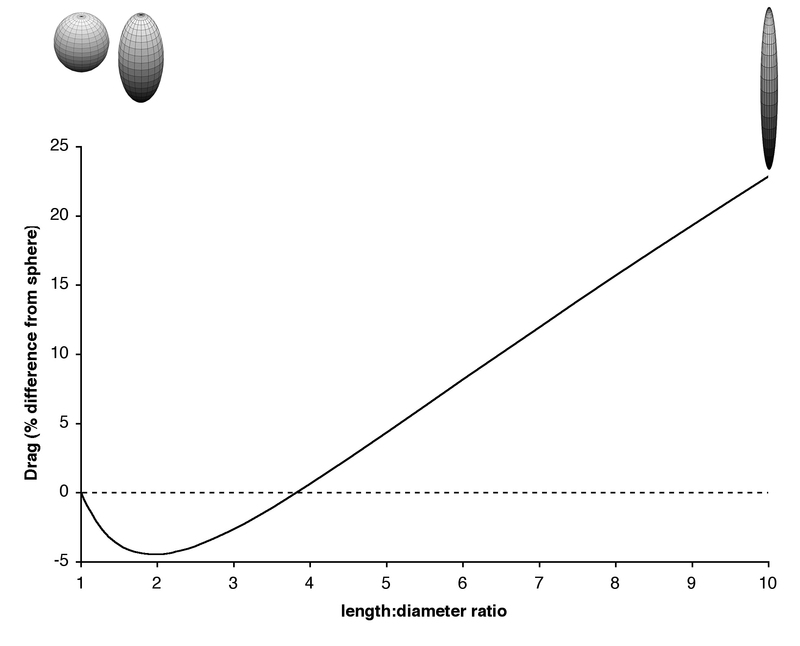 the shape elongates) there is an initial decrease in drag, but this difference only results in drag for the spheroid dropping to a minimum of 95.66% of that of the sphere. The peculiarities of life at low Reynolds number mean that the conventional idea of streamlining is at best futile (Table 2). The knowledge that a streamlined shape reduces drag in the Reynolds number regime of our own experience (usually Re >> 10,000), however, is a compelling idea and has propagated several misconceptions in the literature when applied to low Reynolds number conditions. Indeed, the processes of fluid movement are often so counter-intuitive that problems with interpretation exist throughout biology (See Vogel  for an accessible and engaging overview). Although streamlining has rarely been implicated directly in determining sperm swimming velocity [but see [4, 8, 9]], the belief that streamlining is a 'good thing' appears to be widespread . For example, Moore & Taggart  suggest that sperm pairing in the opossum Monodelphis domestica, allows the two sperm heads to form a more hydrodynamic unit than a single head. However, any reduction in drag is unlikely to offset the additional drag of a larger head unit. The combined beating and synchronisation of the two flagella  is, we think, a more probable explanation for the increased velocity recorded, given the energetic advantages of similar coordination in cilia . In another study, Malo et al. concluded that the shape of the sperm head of red deer, Cervus elaphus hispanicus, is a key determinant of their swimming speed. While the reasoning of these papers is essentially sound from the perspective of the human scale, the complexity of the underlying fluid dynamics means that intuition regarding movement in fluids has been misguidedly applied to the low Reynolds number regime experienced by sperm. With the differences between locomotion of sperm and of larger organisms in mind, we now ask whether sperm length should influence sperm swimming velocity. There seems to be a persistent trend to cite Katz & Drobnis  and Gomendio & Roldan  as support for the idea that sperm or flagellum length is proportional to, and so determines, swimming speed. An examination of the literature provides 65 cases (plus another 5 that are ambiguous) where one or both of these papers are cited as evidence for a link between sperm or flagellum length and swimming speed. However, the points made by Katz & Drobnis  have frequently been misinterpreted. Katz & Drobnis  discuss the forces generated by sperm movement, focusing in particular on forces generated by sperm in contact with the egg. A key statement in their conclusion is that "In general, the longer the sperm flagellum, the greater the forces generated by its motions" (p.132). Katz & Drobnis are perfectly correct in this assertion, but unfortunately it appears to have been consistently misread: the statement only deals with the forces generated by the flagellum. In the case discussed by Katz & Drobnis  the force generated by the flagellum is applied to an effectively stationary egg, a very different situation to the case of a free-swimming sperm. The arguments above suggest that, while force generation does indeed increase with flagellum length, the implications of this for swimming speed are strongly dependent on the size (more specifically the surface area) of the head and the drag that it generates. In fact, in Table 3 and Additional file 1 we show that, because of these underlying hydrodynamic interactions, there is no reason to expect an association between sperm length and sperm velocity. Comparative studies indicate that head length tends to covary with flagellum length with either isometry or a positive allometry [3, 19–21] (but see Anderson et al. and Gage  for instances where no relationship was found). This diversity of patterns in head to flagellum scaling in different groups can explain the diversity of total length to velocity relationships found in the literature (Table 3). The simplified argument that velocity is not likely to be determined purely by length alone (equation (2)), is supported by the results from both slender body theory [70–74], and the simpler, but less accurate, resistive force theory [both reviewed by ]. Both treatments indicate that drag due to the head, and the hydrodynamic interaction between the head and the flagellum of a sperm, will both play a role in determining forward speed. As few studies consider multiple length measures as well as speed [e.g. ], and none provide adequate data for further analysis, we used a reanalysis of Higdon's  results (see Additional file 1) to estimate relative forward swimming speeds for sperm of a range of different species whose head and flagellum lengths were given in the literature. Where raw data were unavailable, data points were extracted from published figures using GraphClick® (Arizona software, http://www.arizona-software.ch). Our flagellum length measures represent the flagellum plus midpiece, except for fishes where the midpiece is an integral part of the head. All analyses were carried out using R v. 2.5.1  with the SMATR package . No phylogenetic correction was used, as the necessary data were not available, and because we were interested in the patterns resulting from different scaling relationships, not the form of individual relationships per se. Reduced Major Axis (RMA) regression was used to describe the relationship between sperm head length and flagellum length (Additional file1). We decided between linear and power functions (log head vs. log flagellum length) on the basis of the amount of variation explained by the two models, selecting the one with the higher R2. We arbitrarily designated an adjusted R2 of 15% as the cut-off for the percentage variance explained by the regression model before we considered there to be no relationship between the two variables. We characterised data where no relationship was found by the ratio of variances between them, and represent these cases by vertical and horizontal lines in the figures. 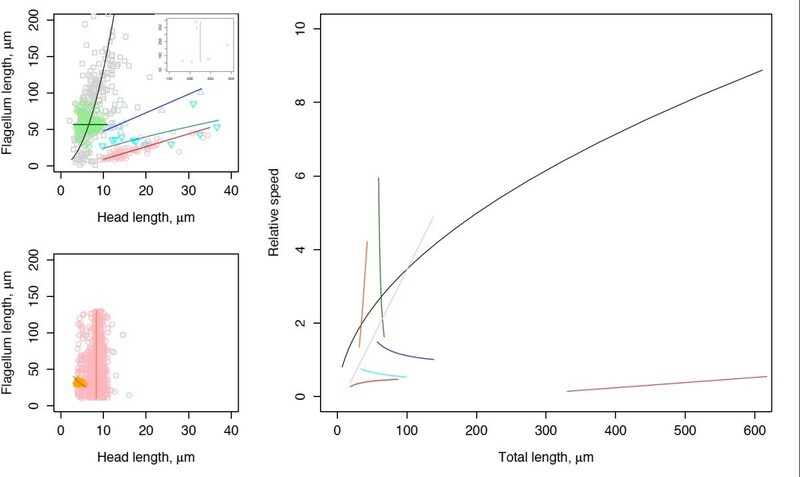 Figure 1 illustrates that the allometry of head and flagellum lengths appears to be taxon-specific and not consistent across species. We next plotted total sperm length (head plus flagellum) against our estimates of swimming speed (Figure 1, rhs). The result is a mix of patterns that cannot be predicted from knowledge of total length alone. Qualitatively similar patterns are seen when other single length measures, such as flagellum length, are used to estimate speed instead of total length. The diversity of patterns also remains if the linear relationship between head and flagellum is relaxed to include curvilinear relationships (data not shown). These results show that the sperm length-velocity relationships commonly reported to take a number of forms (including no apparent link) can likely be explained by the scaling between structural components of sperm cells. It is impossible to consistently predict sperm swimming speed from knowledge of length parameter alone, so it is not surprising that previous studies attempting to link the two have been unsuccessful. However, use of the ratio of head to flagellum length can provide insight into swimming velocity. We focus on sperm length to illustrate that the simple measures used in the majority of sperm competition studies are inadequate to allow proper understanding of the link between sperm morphology and swimming speed. However, flagellar beat dynamics are a primary determinant of swimming speed [14, 71, 73, 77] with swimming velocity highly dependent on the beat amplitude of the flagella. Thus future studies should attempt to characterise sperm kinematics if we are to fully understand the link between morphology and velocity of sperm. A corollary of the above arguments is that several relationships between flagellum and head lengths result in a total length-to-velocity relationship that is an asymptotic function of total length (figure 1). This has an important implication, in that if total length is selected upon by the female reproductive tract [as suggested by ] increasing sperm length (past a critical threshold for negative slopes, or for all cases for positive slopes) is not detrimental to the sperm's swimming speed. This suggests that past a critical total length we can expect selection for speed to be weakened such that further elongation of the flagellum with respect to a given head size does not change the speed of the sperm. In these instances, selection on flagellum or total length, for example via cryptic female choice (see below), can act to influence sperm length without detrimental effects on swimming speed. Recorded relationships between head length and flagellum length. Upper left panel interspecific studies: Black squares – mammals ; Red circles – frogs ; Blue up triangles – shorebirds ; Green diamonds – mammals ; Cyan down triangles – frogs. Inset: Violet squares – beetles. Lower left panel intraspecific studies: Pink circles - boar ; Orange up triangles – salmon. 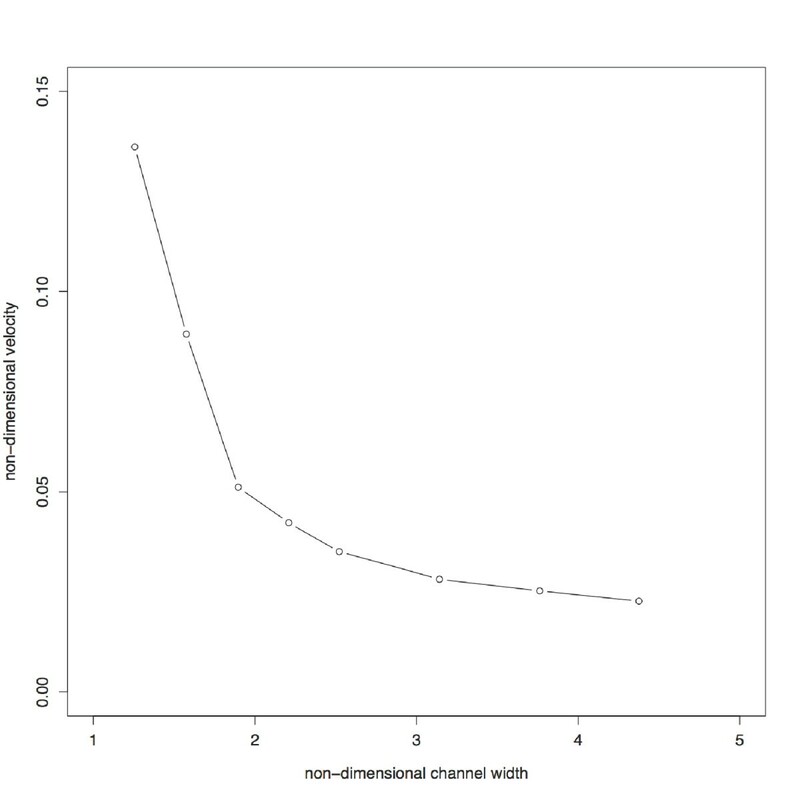 Solid lines indicate RMA regression lines, vertical and horizontal lines are non-significant relationships. Right hand panel: Resulting relationships between total sperm length and predicted speed. Colours correspond to the studies in the left had panels. Note the range of possible patterns, dependent on the scaling parameter c : Black – positive (c = 1.0); Red – positive (c = 1.0); Blue – negative (c = 1.0); Green – negative (b = 0.0); Cyan – negative (c = 0.46); Violet – positive (b = 8); Pink – positive (b = 8); and Orange – positive (c = -0.29). Citations for the studies used are given in the Additional file 1. We suggest that, irrespective of which measure (flagellum length, total length, or head length) is used, attempts to correlate any single measure of length to speed are likely to be futile. In fact, we argue that the rather confusing patterns reported in the literature are due to the use of single measures of sperm length, and that accounting for the balance between drag from the head and thrust from the flagellum will allow us to extend our understanding of the link between sperm form and function. (a) Does sperm competition favour increased sperm length? A number of studies suggest that the selective pressure of sperm competition extends beyond simply favouring males producing larger ejaculates [reviewed by ]. For example, it is commonly argued that longer sperm will be favoured by selection for increased swimming performance, and therefore enhanced competitiveness [4, 8]. Other theories include links between sperm length and longevity , between midpiece size and energy availability , and between size and ability to displace smaller sperm from the female tract . These ideas have gained weight in the light of several comparative studies that show that average sperm lengths are greater in species where polyandry (and therefore sperm competition) is more prevalent [3–5, 21, 27–30]. However, this pattern is not universal and the magnitude of sperm competition can be negatively associated with sperm length [31, 32], while in other groups there is no significant association between indices of sperm competition (e.g. testes size, social group size) and sperm length (e.g. bats: , 31 spp. of primates: , 83 spp. of mammals: ). Across species of passerine birds, positive-, negative- and no- relationship(s) have all been found between levels of sperm competition and sperm midpiece length , while in primates the volume of the midpiece is greater in species with relatively large testes and polyandrous mating systems . Snook  summarizes most of these studies in her Table 1. In short, the comparative data clearly fail to show a consistent relationship between the risk (probability of ejaculates of two males competing for fertilization) or intensity (the number of ejaculates competing for fertilization) of sperm competition and sperm length. (b) Does sperm length enhance competitive success? Few studies have tested specifically whether variation in relative sperm length among rival males influences competitive fertilization success, and thus whether intrasexual selection has the potential to act on this trait. Two studies have reported a fertilization advantage for relatively larger sperm in species with aflagellate amoeboid sperm [26, 36]. However, we are here concerned with the structure and function of flagellate sperm. In the snail Viviparus ater the length of oligopyrene sperm was the best predictor of relative paternity, explaining 38% of the deviance in second male paternity in competitive fertilization trials . However, oligopyrene sperm do not contain the full complement of chromosomes and do not fertilize eggs. While the function of oligopyrene sperm remains unknown, it is clear that these data cannot be taken as evidence for a functional relationship between the length and performance of fertilizing sperm. While Gage et al. failed to find a relationship between total sperm length and competitive fertilization success in Atlantic salmon Salmo salar, Vladiæ et al. reported that in this species the length of the flagellum's end piece did predict fertilization ability. By contrast, Gage & Morrow  reported that crickets with relatively shorter sperm have a fertilization advantage, while others report no evidence for a role of sperm length in influencing competitive fertilization success in crickets [40, 41], or bluegill sunfish . (c) Does sperm length predict swimming speed? Empirical evidence that sperm swimming speed is a positive function of a measure of sperm length is limited (Table 1). A positive relationship between total sperm length and maximum sperm swimming velocity was reported in a comparative study across five species of mammal , with recent reanalysis and control for phylogeny at the family level providing further support . In an intraspecific study of red deer, Malo et al. found that sperm with shorter midpieces but longer heads and longer relative components of the flagella swam more quickly than sperm with long midpieces, shorter heads and relatively shorter flagella components. While Cardullo & Baltz  postulate a link between energy supply, speed and the determination of flagellum length by mitochondrial volume. Pitcher et al  reported a positive relationship between head length and speed in the guppy, Poecilia reticulata, but not between other length measures. Elsewhere, others have failed to establish a relationship between sperm swimming speeds and any component of sperm length [e.g. [42–47]]. For example, Minoretti and Baur  found no relationship between total sperm length and sperm swimming velocity in the hermaphroditic land snail Arianta arbustorum. Likewise, Birkhead et al. 's  study of zebra finches Taeniopygia guttata revealed no evidence that the length of the sperm flagellum, midpiece or tail were correlated with sperm swimming speed, while Gage et al. [23, 46] similarly found no relationship between total sperm or flagella length and sperm motility in Atlantic salmon Salmo salar. The assertion that longer sperm exhibit faster swimming velocities is therefore largely unsupported by the available evidence. Finally, while the simplicity of relating morphology to velocity in sperm is attractive, a further source of selection on sperm phenotype comes from cryptic female choice [48–51]. For example, in internally fertilizing species, sperm must operate inside the females' reproductive tract. Due to conditions that engineers call 'wall effects', the lining of the female reproductive tract can have important effects on sperm performance, because the movement of fluid generated by a swimming sperm becomes constrained when it approaches a solid boundary (Table 4 and Figure 3). This 'wall effect' can take several forms, the two most commonly studied of which have been changes in swimming speed, and attraction of the sperm to the wall surface. All sperm encounter solid surfaces in the form of the egg, but in internally fertilizing species, the female reproductive tract means that a solid (but flexible) surface is present for the entire functional lifetime of the sperm. In addition to influencing movement of sperm in internal fertilizers, and providing a potential mechanism allowing females to manipulate sperm in vivo, the unfortunate combination of speed changes due to the presence of boundaries, and attraction to those boundaries, poses a potential problem for current sperm velocity measurement techniques in vitro, and the biological significance of those patterns. Velocity measurements from samples on slides may not be truly comparable between studies if the impact of wall effects is not quantified, and the swimming velocities achieved by sperm on slides may not represent those achieved in their natural environments. where y is the distance to the nearest wall, and L is the characteristic length of the object (in this case total sperm length). The attraction of sperm to walls, such as glass coverslips, and cell surfaces (such as that of the egg) seems to have been first noted by Dewitz (1886) and quantified initially by Rothschild (1963). Since then several empirical and theoretical studies have been conducted on this phenomenon. Winet et al  used human sperm to study accumulation at boundaries, while Woolley  used a selection of sperm from mice, chinchillas, Xenopus and eels, and Cosson et al. worked with sea urchin sperm. Fauci & MacDonald  used a numerical approach to further explore the effects of boundaries on sperm motion, concluding that hydrodynamic effects lead to the attraction of sperm to boundaries. However, the exact mechanisms involved may depend on the type of swimming motion  or asymmetries in the head-flagellum connection . Computed sperm velocity as a function of channel width. Swimming speed is predicted to increase dramatically as the channel walls become closer. Non-dimensionalised terms are velocity/wave speed of the flagellum and channel width/amplitude of flagellar beat. Redrawn from . The potential importance of female-derived effects can be seen in the increasing body of comparative work on mammals [52, 53], birds [54, 55], and insects [5, 56–61] showing that sperm length is positively associated with the length of the sperm storage organs of females. Interestingly, closer examination of the relationship between sperm competition and sperm length in birds reveals that it is selection from the female reproductive tract that directly explains variation in sperm length . Thus, sperm length appears to respond positively to evolutionary increases in female reproductive tract dimensions . Female sperm choice, mediated by active transport of sperm by the female coupled with variation in female reproductive tract morphology, therefore seems a highly plausible hypothesis to help explain sperm-female coevolution. We also note that there is no a priori reason to expect cryptic female choice to favour long or short sperm. Indeed, female choice often imposes divergent patterns of selection across taxonomic groups so that positive or negative associations between sperm length and the degree of polyandry are equally accommodated by the cryptic female choice hypothesis. García-González and Simmons  have recently shown that in dung beetles (Onthophagus taurus) males with relatively short sperm enjoy higher reproductive success than their longer-sperm rivals during competitive fertilization trials. However, in their study they also showed that the success of males with different sperm lengths was contingent on the size of the female's sperm storage organs: the advantage of shorter sperm was greater when competing for fertilization in females with larger spermathecae . Crucially, a recent quantitative genetic analysis of male and female reproductive traits confirmed that sperm length is genetically correlated (negatively) with spermathecal size , providing explicit support for the evolution of sperm phenotypes via cryptic female choice. The results from dung beetles parallel previous findings in Drosophila melanogaster, where sperm length likewise interacts with female reproductive tract morphology to determine the reproductive success of competing ejaculates [24, 65]. In the case of Drosophila, however, males with longer sperm have the fertilization advantage, illustrating the divergent nature of cryptic female choice acting on sperm morphology. Again, these studies also provided evidence that increased sperm length was genetically correlated with female reproductive tract morphology: selection for increased seminal receptacle length in female D. melanogaster generated a correlated response in sperm length, a result expected if these traits are in linkage disequilibrium . It seems clear that some assumptions regarding the physics of sperm locomotion have hampered our progress in understanding the processes mediating sperm competition. This synthesis of literature from diverse fields highlights the problems of thinking about biological evolution in isolation from physical constraints. While relating sperm length to speed has clear implications for sperm competition, there is a lack of consistent evidence linking the two. However, by taking account of fluid dynamic interactions it is possible to reconcile these conflicting patterns, which should allow future work in this area to progress rapidly. Scaling of the flagellum:head ratio may be more important than simplistic ideas of large and small sperm with differing morphologies. However, due to the influence of wall effects, sperm competition is unlikely to act on sperm length and motility in isolation from female effects. This suggests to us that definitive links between and measure(s) of sperm length are unlikely to be found consistently in internally fertilising species, further complicating any attempts to correlate length to swimming speed. Nonetheless, incorporating realistic fluid dynamics into our theories should enable progress in this area. We recommend that future studies examine the flagellum:head ratio as a potential link between sperm form and function, but recognise that its use is particularly appropriate for external fertilisers, as this group will be least affected by wall effects, and has almost instantaneous fertilisation so that sperm longevity can be ignored. While external fertilisers may offer the best opportunity to test our ideas, internal fertilisers will also be affected in the same way, albeit with the additional effects of walls and other mechanisms of female cryptic choice. We also advocate the reporting of slide-well depths and sperm diameters in all studies and encourage the development of velocity measurement methods less influenced by wall effects than current techniques. We suggest that physical constraints on sperm swimming ability, coupled with the potential for sperm-female coevolution, demand a critical reappraisal of the belief that sperm competition selects for longer, more powerful sperm. Taking account of physics in this way may lead to the development of a framework that allows for non-mutually exclusive alternative explanations for why sperm phenotype seems to exhibit such great variation. SH is funded by a NERC Advanced Fellowship, and JPE and LWS are funded by the Australian Research Council. SH carried out the mathematical analysis. All authors jointly conceived of the study, helped to draft, and approved, the final manuscript.